A couple months ago, the APRIL Festival announced a writing contest, with the winner receiving $100, the publication of their piece right here on the Seattle Review of Books, and a reading slot in the 2016 festival. Today, APRIL announced that the winner of their contest is Jessica Mooney, who you can follow on Twitter right now. SRoB cofounder Martin McClellan and I chose the winning entry, and it took a lot of deliberation. The entries were all so good, but Mooney's "Love Canal" was, in the end, a unanimous favorite. We're very excited for you to read this piece of writing in the spring, and we're also excited to hear Mooney read it in this year's festival. Thanks to everyone who participated, and thanks for APRIL for asking us to take part in this contest. In a meeting with The Des Moines Register’s editorial board today, Ben Carson defended his proposal to crack down on political bias on college campuses by saying that the Department of Education should have the power to secretly monitor classrooms and libraries to root out and uncover potential bias. I'll just come out and say this: if you believe the government should be spying on libraries and classrooms and other places where books and reading are sacrosanct, you are an enemy of America. Since our launch week, we've been wrapping up Rahawa Haile's Short Story of the Day project every Saturday. Now that the project is ended, she was nice enough to sit down with us and talk about it. Look for a new thing for us, coming this Saturday. You’ve been working on this a year now. When did you start, exactly? So you did start January 1st, so it’s almost a full year. Yeah, it’s just that I’ve been slacking in December for various life reasons, and I haven’t been able to update daily, which I feel a lot of guilt about. But, life happens, and nobody’s paying me, so…? In that time, how has your life changed? So the reason I started posting stories was that I needed something to ground me, because I thought the upcoming year would be…I shouldn’t say full of turmoil, but maybe more catastrophic than I’ve experienced. It’s been kind of wonderful to actually have that, to actually have a thing that’s going to bring me joy, the kind of hunt that I know is going to yield results no matter what, and to not know where they’re going to come from has been an absolute delight. It seems that you would have been, before this, would have been like “hey, oh my gosh, I just read this great story by this person,” and most of the writers you were covering were not very well known. A lot of smaller writers, a lot of writers of color, which was important to you. Can you talk a bit about that, and, like, this idea of being a voice of advocacy for things that you love? It’s very difficult to get short story collections published. And it’s a special kind of person who subscribes to several literary magazines just for the fun of it, who isn’t also a writer, and is able to purchase as many books as they’d like. So, I just started to see these smaller writers, especially women, and especially people of color, but other minorities as well, just kind of slip through the cracks. Because it’s so hard to publish a short story collection not tied to a novel, you know? And the people who do, and who often get praised, tend to be white men. I kind of touched on this in a previous interview, but it’s not just what gets seen, it’s who has access to MFA programs, you know, who can afford to incur that kind of debt, who can afford that kind of financial instability when they’re done with their program. If it seems as though there’s this entire literary system really meant to propel and celebrate white men, I assure you there is. But those aren’t the only people writing. And in fact, they’re not always the most interesting people writing, despite whatever advantages they may have. I think, at a certain point, especially if you are a writer of color, you get tired of being told that the kind of narratives you encounter when you look for stories, are the only ones that exist. So, I wanted to have a way for people — for you know, allies, white allies, but also for minorities — to see themselves reflected every single day. That mattered a lot to me. And some people were more popular than others. Of late, maybe the past four months, the stories have been constricted to the last five years, just because I haven’t had time to really delve into all the anthologies I would have liked to check out from the library, and hunt down books I had previously read that I wanted to screenshot but don’t own right now. That’s one of the things I was really trying to avoid, but I couldn’t. I just didn’t have the time. I wanted people to see themselves reflected, but I also wanted the editors and agents who followed me on Twitter to have a daily reminder that there are so many people, who aren’t white men, writing brilliant words, and that perhaps they are worth pursuing. In fact, that’s how my agent found me. Talk a little about that. So an agent found you through your story a day project…? That’s fantastic, congratulations! Can you talk about some of your own work and plans for the future? Thank you! For the past few years I’ve had a really depressing day job that I’m quitting in February. Then, I’m hiking the Appalachian trail — or attempting to. I should rephrase that, I’m attempting to hike the Appalachian trail. It’s a self-preservation thing. There’s enough fear of failure as it is. But then I plan to write full-time after that. I will be writing a lot more fiction in addition to journalism. The thing that has fallen away most while doing this project, and working a day job, and preparing for this hike is my own fiction. And I really miss it. I miss it the way one misses a loved one. I’m definitely looking forward to writing short stories again. That’s where my heart lies. When you go on any kind of journey, and you come back home, home always looks a little bit different. How do you think, after reading so many short stories — maybe more than you were reading previously because of the deadline? — have you noticed any changes in approaching your own writing? Yes. Great question, thank you. I’ve been asked by other people if I had a preexisting list of 365 short stories I wanted to share with the world. Like I just came home, and clicked tweet, and called it a day. But no, that one story that I shared came from going through, at minimum, twenty stories. Every single day. Granted, I wouldn’t necessarily get to the end of every potential story, but I would read enough to see if it was something I wanted to explore further. And that has been kind of a revelation to me. I’ve heard fiction editors from literary magazines say what I’m about to say, but you learn a lot about how to write by reading other people’s writing. Especially people you respect, but also people who are doing good things that are just a hair shy of being great. It hits home when you see yourself and your writing tendencies and your shortcomings reflected that way. I feel as though I have a better grasp of how the things I’m not great at can be very effective in storytelling, and I will be actively working toward bettering those weaknesses in the near future. Probably after my hike — I have a hard time imagining bettering myself in any way that doesn’t involve running, or climbing stairs, or doing yoga, or squats, or anything that doesn’t strengthen my core before October. But yeah, I’ve gotten a much better grasp of what I don’t want to do, but also a better grasp of what I do that I can now see doesn’t work, repeatedly, in stories from all over the world, all different backgrounds, all different kinds of stories. Some things just aren’t enough. One of those things for me is I’m not the biggest fan of dialog. I tend to write shorter pieces that don’t need a lot of it, but I can also recognize that those pieces could benefit from more than they currently have. And while reading many of these short stories this year — I gravitate towards flash fiction — but reading so many stories between 1,000 and 10,000 words, I’d see such a dependence on exposition that I'd think was detrimental. And I think it’s because it’s very hard to know how to get your characters to talk to one another when you haven’t really figured them out yet. How much were you relying on internet journals, as opposed to print journals, and newer, smaller publications? Here’s the thing about print journals not publishing many minority writers: It’s hard to turn to them when you’re looking for minority writers. But I would like to take a second to give a huge shout-out to Housing Works bookstore, which is a great organization, but they also have one of my favorite used anthology sections in New York, and also a backlog of literary magazines I was able to peruse in 2015. I discovered so many people who seemed like they were fairly big decades ago, who I guess popular culture has forgotten. So, that was great. But at a certain point I had to come home and post a story, and all I had was the internet. When that happened, I started to look outside of America. I mean, historically there’s very much an “America is not the world” understanding within the short story tradition. One of the things I’ve mentioned to friends is that I don’t read enough works in translation. I don’t know what’s happening with the modern short story in most of South America. There was a Believer piece about these intense matches between writers that take place in Peruvian wrestling rings where they try to write the best short story they can in a few minutes…I don’t know if you saw that piece? It’s an intense piece. But as far as what I actively pursue, and what people actively pursue, there’s only so much time. If I had to only depend on the internet…I often try to look outside of major metropolitan areas. Like, I don’t need another…you know, I’m happy to post New York short stories, but it starts to feel so insular. So yeah, I admit that one of the things I wish I had time to do better was to rely on a variety of sources. 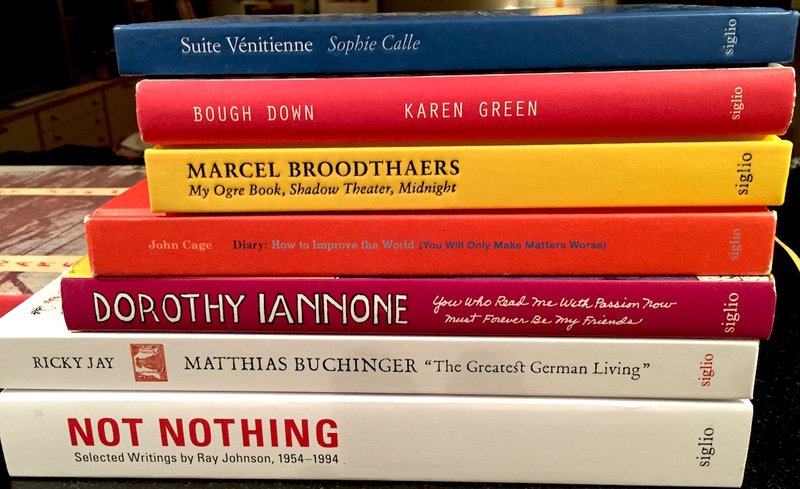 Originally it was a healthy mix of lit mags, and physical books and anthologies, and online magazines, and audio as well — a few podcasts here or there, and people reading their work…. You know, Conjunctions has a pretty decent archive of all of their issues, and there are many famous short story writers reading their pieces. Another thing that just kind of blew my mind is the fact that many online journals don’t offer sample writing. No section that says ‘Hey! Here are some short stories we’ve published’. I don’t mean access to the entire journal, but seriously, no samples whatsoever. And I find that so confounding — I don’t understand how a tiny journal wants people to submit to it if they can’t read the kind of work the journal publishes. I’ve always found that kind of difficult. When I was trying to write more for journals and get short stories published, which I’ve moved away from, but it was: you could invest in so many journals or go to libraries, but you could spend 40 or 50 hours looking through a single journal trying to understand what they want, which is time that is probably, for a young writer, better spent writing. It’s a really tricky proposition. I think so. I think at a certain point you need to ask yourself who you’re writing for. Like, is the goal to get published so that you can say you were published somewhere, or is the goal to be read as widely as possible? I know that argument comes up a lot when people discuss whether writers should write for free, or should write for lower rates than they deserve. I can’t imagine working on a short story and not wanting it to be seen by as many people as possible, especially knowing that the monetary rewards are so minimal regardless of venue. 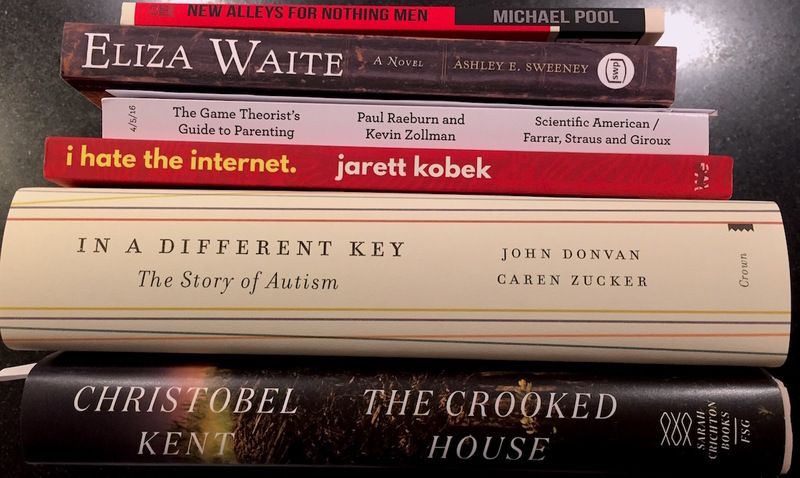 It seems like that the set piece is, whether or not you go to graduate school, to work through the journals, to get an agent’s attention, to try to get a novel deal. This is the path of so many writers, and I think there’s a huge swath of people who are interested only in short stories that don’t get as much attention, because they’re not as commercial potentially, or for whatever reason. They don’t sell! I mean, that’s why. You see people who are like “Oh, the internet has shortened people's attention spans, and these shorter stories should be so popular.” But, yeah, short story collections don’t really sell as well as novels, which is why they’re not purchased by editors as often as novels. I mean, you know, it helps to have certain stories appear in certain reputable mags. But, it’s difficult. I can’t ever see myself exclusively writing short stories. But I think they’re worthwhile nonetheless. And I think if one puts forward the kind of energy needed into making a good one, it deserves to be celebrated. And I also think that one of the things that happens is that many minorities, for one reason or another, can’t place their stories in bigger magazines, and they end up in smaller magazines that probably have websites, but no samples available! I really appreciate the project. The reason I asked for permission to wrap-up on the weekends is because I thought it was really important, and I loved the attention you were bringing, and the exposure, to writers I’d never heard of. So, personally, I really appreciate it. Is there anything I should have asked, or something you’d like to talk about? I would like to make a small apology. One of the things I’ve realized is that my most accessible minority in 2015 was the white woman. I used many stories by white women. It wasn’t until the end of the year that I realized just how many. I think, without going too deep into the reasons why that might be and the importance of intersectionality, it’s something that I wasn’t aiming to do, but something I ended up doing. And that reveals certain biases of my own, ones I should have been better at catching that I can fully recognize now. You know, the whole reason I put this project together was yes, I want to celebrate minorities, and that includes women, but often I ended up celebrating white women because they were the nearest ripple in the minority pool. I can’t emphasize how much of that had to do with time constraints; there are so many more easily accessible great short stories written by white women than there are by people of color. But still — when I look at this project, this seems to be its greatest weakness. I’ve taken note of that — and I plan to think about it more when it comes to how I discuss short stories, what I look for in them, and the extent to which that is a product of training. Our thanks again to Rahawa. You really should follow her on Twitter. Short stories aside, she's the leader of a rag-tag group writers who are also cumulus appreciators, called Cloud Twitter. The Seattle Office of Arts & Culture,(ARTS) in partnership with Seattle Department of Transportation (SDOT) seeks a practicing, published poet, fiction, or creative non-fiction writer for a unique project-based artist residency in the northwest tower of the Fremont Bridge. The selected writer will undertake an in-depth exploration of the bridge and write a piece in response to the experience. It's a shame that students and unpublished writers "are not eligible to apply" for this residency, but hopefully this project will be successful enough that future residencies will be open to anyone. The idea of an art gallery/comic shop isn’t anything new — head south of the city to the Fantagraphics Bookstore and Gallery if you don’t believe me — but it is an idea that we should encourage. As the arts continue to suffer through the atrophying of nonprofits, we’re seeing disciplinary lines blur in nontraditional spaces, and interesting things are happening. 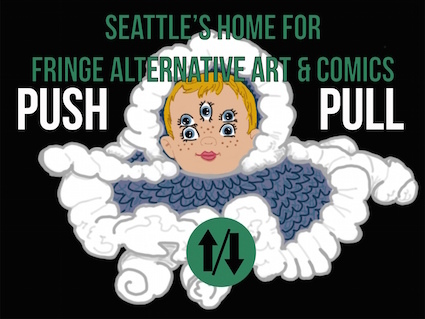 If you’d like to visit Push/Pull yourself, it’s open every day from 10am to 6pm, but this Saturday it’ll be open late for the Ballard Art Walk, which happens every second Saturday. That’s an optimal way to appreciate the space — when it’s full of people drunk on free (mostly bad) wine, talking about art. In the weeks to come, we’ll be talking with Follis and her Push/Pull compatriots about the challenges and joys of launching a bookstore — in fact Seattle’s newest bookstore, if I’m not mistaken — in the middle of a gallery. This morning, the comics internet blew up when the long list for this year's prestigious French comics award, the Grand Prix d’Angouleme, was announced. The list of 30 candidates did not include one single female cartoonist. And in case your first instinct was to mansplain this fact away — "durr, but maybe no woman produced a comic worthy of awards this year," I can hear the gamergate crowd grumbling, as though that made any sense at all — you should bear in mind that in the Grand Prix's 43 years, only one woman has ever won the award. This is unacceptable. French group BD Egalite responded to the shortlist announcement by calling for a boycott. In the wake of today’s announcement, Fantagraphics Books and Daniel Clowes endorse the French group BD Egalite in its call for a boycott on voting for this year’s list, and Clowes has announced that he will withdraw from consideration as a result. “I support the boycott of Angouleme and am withdrawing my name from any consideration for what is now a totally meaningless ‘honor.’ What a ridiculous, embarrassing debacle,” says Clowes. Yes. Thank you to Dan Clowes and thank you to Fantagraphics Books for taking a stand. Now all eyes have turned to the other creators on the long list — including Charles Burns, Brian Michael Bendis, and Chris Ware — to see if they'll do the same. As you likely already know, the Hugo House building will be torn down this spring and a six-story mixed-use development will be built on the site. The Hugo House is scheduled to reopen in the new building sometime in 2018. (Mary Ann Gwinn published a preview of the new House in the Seattle Times last week.) But until today, we didn’t know where the House would be operating during the interim. Every time the Hugo House move is mentioned online, it’s always chased with comments by people who say that they’re sad the House is going away, and that they’re less likely to attend House events in the future because the character of the old House is disappearing forever. On the one hand, this is understandable: Seattle is very sensitive to change right now, and writers in particular tend to be very change-averse. But I’d just like to say that the cliche about cutting off one’s nose to spite one’s face was tailored for situations just like this one: if you’re looking to penalize a nonprofit writing organization for adapting to the changes in the city around it, you might want to rethink your priorities. We’ll have plenty to say about the old Hugo House in the months ahead — I’ve had a lot of good times in that building — but we’re also very excited about the possibilities that the new space provides. And this partnership between the Frye and the Hugo House offers up some very interesting opportunities as well. In a time when Seattle seems to be becoming more and more Silicon Valley-style libertarian, it's heartening to see that our arts organizations still have each others' backs. Where does the North begin? This poem first appeared in LIT. Heading east for the American Library Association Midwinter meeting in Boston? Are you interested in the future of books and reading? Check out the CODEX hackathon over at the MIT Media Lab January 8-10. The concept of a hackathon may seem daunting if you're not a developer or designer, but really, don't be intimidated. Typically, small groups of people are put together to work a problem, or respond to a conceptual prompt. As they say on the site, "Programmers, designers, writers, librians, publishers, readers. All are welcome." If you have the interest, and ideas of what people are doing right and wrong, you will fit right in. Here's some writing on what the previous CODEX in San Franscisco was like. There's so much work yet to do on what books will evolve into. The best way to make your voice heard is work with people applying themselves to the problem at hand. This is a great opportunity to get involved. Cartoonist Gene Luen Yang, who is best known for the excellent memoir American Born Chinese, has been named the first Ambassador for Young People’s Literature by the Library of Congress. 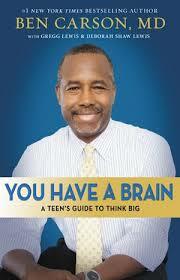 He'll be great at this gig, and it's wonderful that the LoC is promoting literature to young people. We're so excited about our first sponsor of 2016. Mineral School is an overnight artist's residency situated in an old elementary school in Mineral, Washington. It's in the foothills of Mount Rainier, an idyllic and perfect setting for an artist focusing on getting some work done. If two weeks dedicated to your writing in an amazing setting with delicious food provided seems like a dream to you, then you should get your application in as soon as you can. Find out how on our sponsors page. Plus, we have poems from two Mineral School alumns on the sponsors page to inspire you, and a link for you to submit your application (psst! The poems are good enough that you may want to read them even if you aren't going to apply). Our thanks to Mineral School. It's sponsors like them that keep original content on our site day after day. They've joined in our campaign to make internet advertising 100 percent less terrible, and we're so grateful that they did. Paul Constant review Nick Licata's Becoming a Citizen Activist. After four terms as the most influential lefty in Seattle politics, Nick Licata retires from the city council today. Tomorrow he's publishing a guidebook for citizen activists. Can the book live up to the career of its author? MONDAY Elliott Bay Book Company kicks off your new year of readings with Siamak Vossoughi, a short story author who is originally from Iran but who now lives in Seattle. His first collection of stories is titled Better Than War, and it’s a winner of the Flannery O’Connor Prize. TUESDAY Science fiction author Dave Bara celebrates the debut of the second book in his space opera series The Lightship Chronicles at University Book Store. In it, the crew of a spaceship must investigate a mysterious space station. THURSDAY Elliott Bay Book Company co-presents a reading with novelist Ru Freeman and local authors Tess Gallagher, Peter Mountford, and Alice Rothchild. They’re all contributors to an anthology titled Extraordinary Rendition: (American) Writers on Palestine. It features 65 pieces of journalism, essays, poetry, and fiction about the Palestinian experience. 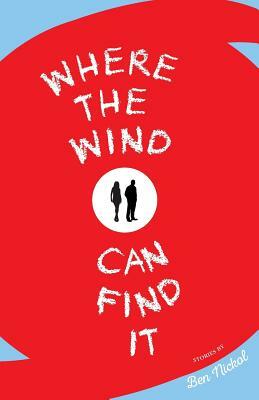 FRIDAY It’s back to Elliott Bay Book Company with you for a reading from a Montana-based writer named Ben Nickol, who is the author of a short story collection titled Where the Wind Can Find It. These are stories mostly about people who live near wildernesses. SATURDAY Our last visit to Elliott Bay Book Company this week is a celebration of the life of Seattle poet Madeline DeFrees. DeFrees, who passed away in November, was one of the very best poets our region had to offer. Local writers including Kathleen Flenniken will be presenting her work and celebrating her life. This is not to be missed. SUNDAY University Book Store closes out your week with a memoir by Katherine A. Hitchcock. Hitchcock was one of the very few women in Silicon Valley in the late 60s, 70s, and 80s, which means she helped computers transform from gigantic monsters to tiny little handheld time-sucking devices. Her memoir is titled Atypical Girl Geek. Impressive in both presentation, and reporting, this Washington Post piece about the future of AI, and the people who worry over it, is endlessly fascinating. The Ghosts of Christmas: Was Scrooge the First Psychotherapy Patient? Okay, I know, we're into the new year and any tree left standing is one we should sneer at, but I loved this one last thought about A Christmas Carol — Elif Batuman looked at the psychology of Scrooge, and found something familiar. That night, I decided to read the full text. Thanks to my robust personal experience with depression of both the normal and the holiday variety, I immediately recognized Scrooge’s condition, in a way that I had been unable to as a child. (Dickens himself was depressive, and probably bipolar.) I realized that I had misremembered Scrooge as gleeful in his miserliness, a human version of Scrooge McDuck, whose exuberance is eternally preserved in the cultural imagination by the image of the “money dive.” In fact, Scrooge takes no joy in anything. His London is a dystopian hellscape riddled by sickness, injustice, cold, and want. Money is the only protection—frail and inadequate—against these horrors, and Scrooge’s only thought is to work as hard as he can, every day, to store up as much money as possible. Joe Allen recalls our American tradition of fascism, looking at Father Charles Coughlin, and his taking on of the airwaves. Everybody you know got them for the holidays, but when they first appeared in the 60s, they were quite a bit more subversive. One more day to read an excerpt from Anne Kelleher's exciting the Jesus Gene on our sponsors page. Anne is the author of more than a dozen books, with a career bridging from major publishing houses and agents, to making new ground in self-publishing. Sponsors like Anne are what keep us running with the original content you see every day. We're so grateful she joined with us again to sponsor the site. Thanks to her for being part of our campaign to make internet advertising 100 percent less terrible. Every day, friend of the SRoB Rahawa Haile tweets a short story. She gave us permission to collect them every week. She's archiving the entire project on Storify. This is the last wrap-up, since the project is now over. We'd like to offer Rahawa a hearty congratulations on a big project nicely executed. We'll miss seeing the stories every day, but still have many to comb through, and even some to read again. Short Story of the Day #363 Be fearless in your writing. Hug your best metaphors; have few. Be true to the pizza or sadness in your story. Short Story of the Day #364 Work on bettering dialogue. Really. Everyone do this. Feed your characters dimensions even when you are starved. Short Story of the Day #365 There is a place for you and your art and your vulnerability and your brilliance. Please keep writing. Please. Paul Constant review Noy Holland's Bird. The first day of the year is a weird holiday — part future, part past. Noy Holland's new novel Bird demonstrates the problem with giving the past too much power. 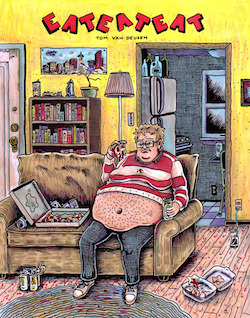 Seattle cartoonist Tom Van Deusen’s newest book, EAT EAT EAT, is the latest entry in a long comics tradition: a humorous book about a feckless loser who doesn’t possess the self-awareness to realize that he is a feckless loser. 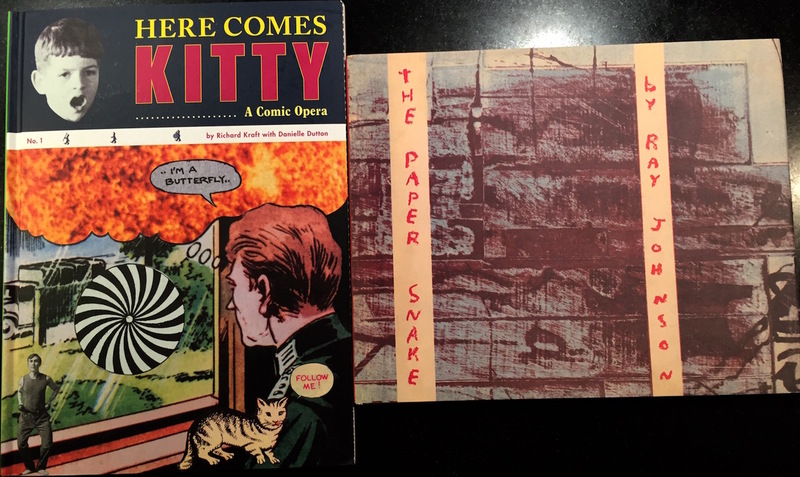 It’s a somewhat proud (if self-loathing) lineage, stretching to Chris Ware and Ivan Brunetti from R. Crumb and Dan Clowes and on and on and on. EAT EAT EAT is the story of a feckless loser named Tom Van Deusen (the indicia informs us that the book “is a work of pure fiction. Any assertions otherwise are an insult to God and His reality, so how dare you.”) He sits in his apartment, eating whole frozen pizzas and growing fat. He goes on a date with a woman he tracked down on Facebook, and he’s so impossibly self-centered that things turn out badly. Van Deusen’s portrayal of Van Deusen is entirely at the level of caricature; the cartoon Van Deusen can’t walk past a street food vendor without buying something, even after his date affirms that she’s a vegetarian and she has no interest in eating bad food handed to her by a stranger on a street corner. Then, after the date implodes — the word “m’lady” is involved — Van Deusen tries to join a gym. Things only get worse, and more absurd, from there. Your taste for this brand of comedy will vary, of course. As someone who read a lot of alternative comics in the 90s, I appreciate what Van Deusen is going for, but I have seen this particular scenario play out in dozens of comics; at this point, the overly pretentious hate-able loser routine feels almost like a nostalgia act. Van Deusen pulls it off really well — he’s undeniably a funny, talented cartoonist — and he invents some new angles on the routine, as when the cartoon Van Deusen “maintain[s] his Facebook angles” on his date, which means he tries to keep his face in the same tortured position as the flattering photo on his Facebook profile as he and his date walk around. It’s an additional, modern humiliation to heap onto the time-honored tradition. The strips collected in EAT EAT EAT were originally published between 2011 and 2015, and it’s astonishing to watch Van Deusen’s illustration develop and grow over the span of those four years. His early style had a rough charm to it — it was too feathery for my liking — but his later work is developing a nice cartoonish roundness that plays off the prickliness of the writing in a particularly pleasing way. By the end of EAT EAT EAT, the cartoon Van Deusen is just as delusional as ever, but the cartooning Van Deusen leaves the book well-equipped for whatever his next comics challenge may be. I, for one, can’t wait to see what he does next. Paul Constant review Connie Willis's Remake. Twenty years ago, Connie Willis wrote a science fiction novel about the future of Hollywood. How did her predictions turn out?